Until now, each new generation of cellular network technology was designed to provide better voice or data performance for mobile devices. With 5G, however, this is changing. 5G is being conceived for a brand-new world of diverse wireless applications that ranges from broadband wireless access to the internet of things (IoT). Mobile device users will benefit from 5G technology, but the real impetus for 5G is new wireless applications like autonomous cars, industrial automation, broadband wireless last mile, and others that need a pervasive wireless WAN capability with a unique feature set that is different from today’s network technology. Given these diverse needs, 5G will look different from previous technology generations. A significant part of wireless industry 5G activity is focused on developing the capabilities of multiple technologies that serve these applications and, in some cases, developing the ability for devices to seamlessly switch between multiple technologies. Standards body work regarding 5G cellular RF technology is ongoing. For designers considering the evolution of their products to 5G networks, some challenges that will need to be factored into test plans revolve around user experience testing and adapting testing to the application. This is the first part of a two-part series that will look at what is known about 5G networks today, as well as examine some of the use cases. 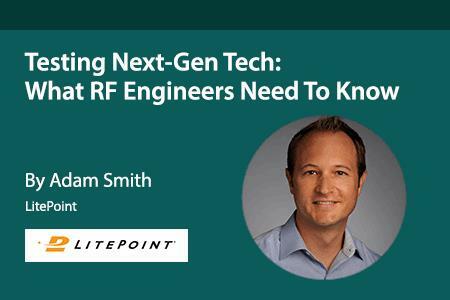 The next article in the series will examine what product designers should know about the RF testing challenges that lie ahead for 5G products. IoT — Data collected wirelessly from a large number of mobile or fixed sensors provides intelligence to improve processes. Examples include smart parking, street lights, trucking, and farming. These applications don’t always need a lot of bandwidth, but it’s important to have low latency, to accommodate a lot of sensors, to have high quality of service, long battery life, long signal range, and security. Broadband Everywhere — This is envisioned as a replacement for fiber optics in high-bandwidth fiber-to-the-curb, backhaul, and last mile applications. Wireless technology for this application requires multi-gigabit bandwidth, long range, and significant network capacity. Remote Device Operation — In this application, a trained professional or operator controls a device remotely, with applications including machinery operation, factory automation, and even remote surgery. The wireless network in these examples is primarily sending control signals which require low latency, quality of service, and security. Autonomous Vehicles — This is one of the hottest topics in automotive industry, and the advanced guidance systems that make it possible depend heavily on wireless communication between sensors in the car and in other cars, street lights, and the road. Wireless networks supporting this application must be very responsive with low latency and quality of service along with long range and security. Media Everywhere — Streaming video and audio are already very popular wireless use cases; improvements in 5G networks will provide added capacity, range and bandwidth needed for this trend to continue growing. Fig. 1 provides an overview of each of these use cases and the wireless network features that are important to them. No one wireless technology can cost-effectively serve all of these needs. Thus, the industry is expected to move forward with a toolbox approach of different technologies for different needs. In the toolbox are cellular technologies, as well as wireless LAN (WLAN) and low-power wide area network (LPWAN) technologies. The cellular networks that will play a big role in 5G include evolving 4G/LTE standards and 5G New Radio (NR) Technology. Cellular standard development is managed by the 3rd Generation Partnership Project (3GPP), which has defined cellular network evolution in a series of technology releases: LTE-Advanced (Releases 10-12), LTE-Advanced Pro (Releases 13-15), and 5G NR (Release 16 and future). LTE-Advanced — In 2011, the LTE-Advanced standard was put into development, and it now is starting to be rolled out to market by a few mobile network operators. The new standard aims to achieve 1 Gbps peak upload speeds and 500 Mbps peak download throughput with latency of 10 ms.
To improve performance, LTE-Advanced features carrier aggregation, which combines the data transmitted across up to five frequency carriers and bands. Spectrum utilization is expanded to include both FDD and TDD duplexing techniques, which makes additional bandwidth available. The LTE-Advanced standard makes expanded use of multiple input-multiple output (MIMO) antenna systems. MIMO helps to overcome multipath limitations by utilizing the multiple signal paths that exist between a transmitter and a receiver. This improves the throughput available on a given channel. MIMO technology supporting two antennas (2x2) was implemented in LTE, but the LTE-Advanced standards include eight antennas (8x8) on the downlink and four antennas (4x4) MIMO on the uplink. LTE-Advanced Pro — The goal of LTE Advance Pro is to increase peak throughput levels to 3 Gbps, with latency of only 2 ms. The LTE-Advanced Pro standards (Releases 13-15) will build upon features added to LTE-Advanced, as well as add some new capabilities. Carrier aggregation will be improved with up to 32 different carriers specified, up from five in LTE-Advanced. Support for different RF frequency bands, primarily the 5GHz band used for Wi-Fi, also is increasing with the addition of Licensed Assisted Access (LAA), enhanced LAA, and LTE-Wi-Fi Aggregation (LWA). One of the more intriguing 5G scenarios is leveraging millimeter wave (mmWave) frequencies, which reside in the 30 GHz-300 GHz frequency band. Several industry leaders and standards bodies are actively researching this, and the FCC has proposed new rules for the 28, 37, 39, and 64-71 GHz bands that could help the development of 5G technology at this frequency. There’s a lot of bandwidth available in mmWave frequency band, but working with these high frequencies has been a design challenge in the past. Existing mmWave solutions are focused on point-to-point, short-haul broadband applications. The technology has not had widespread success due to its short transmission range and potential for weather-related interference. Even as the industry considers mmWave for mobile devices, its transmission range will remain short. Thus, a very high-density network of small cells — estimated by some as one cell per 12 homes — will be required for adequate coverage. The impact of 5G mmWave technology will be to deliver massive bandwidth for broadband, streaming, or virtual reality applications to a device while also supporting LTE-Advanced Pro for mobility. 802.11ax — This technology is expected to have an early roll out in 2017 and has been lab tested at nearly 11 Gbps max throughput with connection speed of 1.4 Gbps. Even though the new technology has more bandwidth, the key objective of 802.11ax is to support more users; its goal is to support 10 times more simultaneous users than the previous 802.11ac technology. The technology uses some of the same techniques for performance as the cellular standards, including 4x4 MIMO. For improved spectrum efficiency, 802.11ax adopts Orthogonal Frequency Division Multiple Access (OFDMA), a signal modulation technique that delivers better spectral efficiency and is less sensitive to frequency-selective fading. Just like Wi-Fi today, 802.11ax offers high-bandwidth and in-building mobility, and could be a good alternative for both data-centric use cases and in-building cellular offload. WiGig — WiGig (802.11ad) promises low latency connections up to 7 Gbps and complements Wi-Fi for very high bandwidth, short-range applications, such as connecting a computer to HD/UHD displays via the WiGig Display Extensions, providing peripheral connectivity wireless connections to storage or servers via WiGig Serial Extension, WiGig Bus Extension or WiGig SDIO Extension. For consumers, WiGig will provide a great experience for virtual reality, medical, or similar high-bandwidth applications. But, like 5G NR, WiGig operates in the mmWave frequency band, meaning that it is restricted to in-room, short distance applications. It is anticipated that devices supporting WiGig also will have radios that will transmit on LTE or Wi-Fi frequencies (2.4GHz and 5 GHz). IoT is a significant 5G use case that will need its own technology. Some IoT applications can utilize cellular or WLAN networks, and others — like wearables — will take advantage of personal area networks. But most of the applications now envisioned require low-power wide area network (LPWAN) technologies. There are several LPWAN market leaders and emerging technologies, including LoRaWAN, Sigfox, and NarrowBand IOT (NB-IOT). What they all have in common is that they facilitate long range, low bit rate communications to and from battery-operated sensors that are either mobile or static. In many cases, service providers have set up LPWANs operating complementarily alongside their higher-speed cellular networks. Except for cellular-based LPWANs (NB-IOT), most operate in the unlicensed ISM band. Some 5G devices will need to support multiple devices, which will require improvements in handoff technologies. Today’s mobile devices have reliable, low-latency base station handoff mechanisms to facilitate seamless mobility, but switching a data or voice session from one radio access technology (RAT) to another (LTE to Wi-Fi, for example) still has significant latency that causes a session to drop during hand off. New 5G mechanisms must be developed to facilitate this handoff while not backing off on link connection speeds. 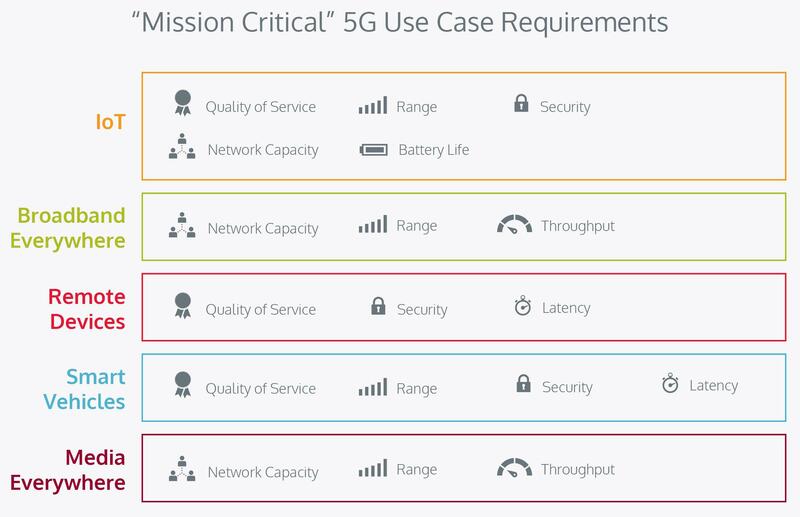 5G handoff management is made more difficult by lower latency applications, higher bandwidth, increased number of RATs, and HetNet density, necessitating more frequent handoffs. Successful 5G base station handoffs will be enabled through better base station understanding of quality of service considerations, signal-to-interference ratio (SIR), and how much time is required for the handoff. Ideally, the base station can collect this data from the mobile devices and compare against a threshold value to know at what point it must hand off the session to another base station. For RAT handoff, intelligence must be built into the mobile device so that it can analyze signal strength and quality from its own base station or access point. If these values fall below a certain threshold, then the device must scan other nearby access points or base stations to understand their traffic load, spectral efficiency, and transmitted power levels. Once the analysis is done, the device must be able to select and connect to the best connection point. 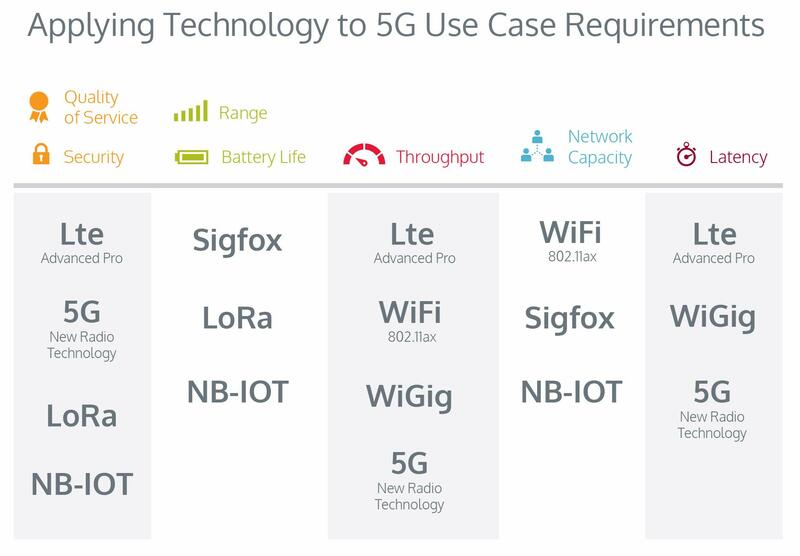 Some of these capabilities are in today’s mobile devices, but they will need to be further developed to accommodate the low latency, multi-RAT environment of 5G. The 5G “toolbox” approach is delivering the technology capabilities needed for a very diverse range of applications. The increased number of wireless technologies gives developers new tools to develop the wireless products of the future. But, this toolbox approach also increases complexity, which could negatively impact customer experience unless properly designed and tested. In the next article in this series, I’ll look at the testing challenges that developers need to plan for to ensure a quality user experience.